A Standard of Grace is a gorgeous four-color, joy-inspiring guided journal designed to help you nurture your dreams, discover your hopes, and pay attention to those things you hold dearest to your heart. With quotes, journaling prompts, and Scripture, bestselling author of Grace, Not Perfection and A Simplified Life Emily Ley, encourages you to reach for the life of you want-all while holding to a standard of grace. 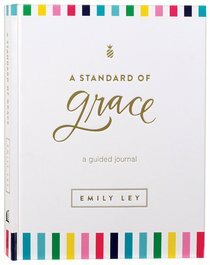 About "A Standard of Grace: Guided Journal"
Emily Ley is Founder and Creative Director of Emily Ley Paper & Gifts. She is also the creator of the bestselling Simplified Planner --a daily agenda for what matters most. Raised in Pensacola, Florida (home of the most beautiful beaches you ever did see), Emily graduated from the University of West Florida with degrees in English, creative writing, and public administration and then went on to become the executive director of the city ballet. From there, she worked in nonprofit management and public relations before launching her brand in 2008. Following the success found at its online home, EmilyLey.com , the Emily Ley brand quickly grew to be carried in over 500 retail outlets across the United States and around the world. Emily has been recognized with numerous awards, including Best New Product--Desktop (for the 2015 Simplified Planner®) at the National Stationery Show as well as Top 10 Designers to Watch in 2015 by Stationery Trends Magazine. Now as a businesswoman, wife, and mama to three, Emily enjoys Friday pizza parties on the living room floor, strong cappucinos with her college-crush-turned-husband, and making memories to savor for a lifetime with her twins and preschooler.